Pixel Dust Pie review: An AOSP ROM that you will come to love - AndroGuider | One Stop For The Techy You! Let me start this review by telling you that the ROM lives up to its claims: it has an outstanding battery life, buttery smooth feel and many usable custom features. Pixel Dust has been around for quite some time now. There were builds of the ROM for Nougat, Oreo, and now the Pie based release of the ROM is available for multiple devices. 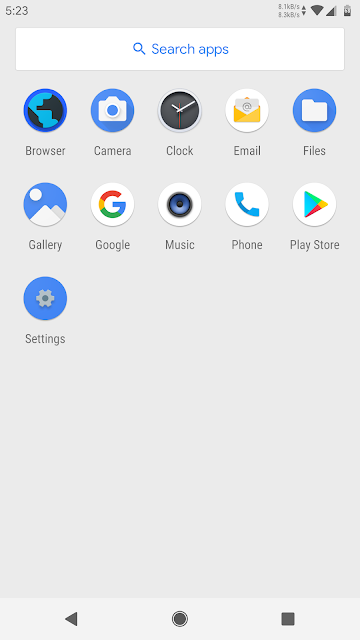 Pixel Dust Pie is an AOSP based custom ROM with the look and feel of pure AOSP but with added features that the developers feel should have been included by Google from the get-go. If you are someone who enjoys watching a review more than reading one, then you can check out the video review that I did over at Hayes Tech & ROM Reviews. This is why most of us use custom ROMs: to get that extra set of features which are not present in AOSP. Pixel Dust has a long list of features. 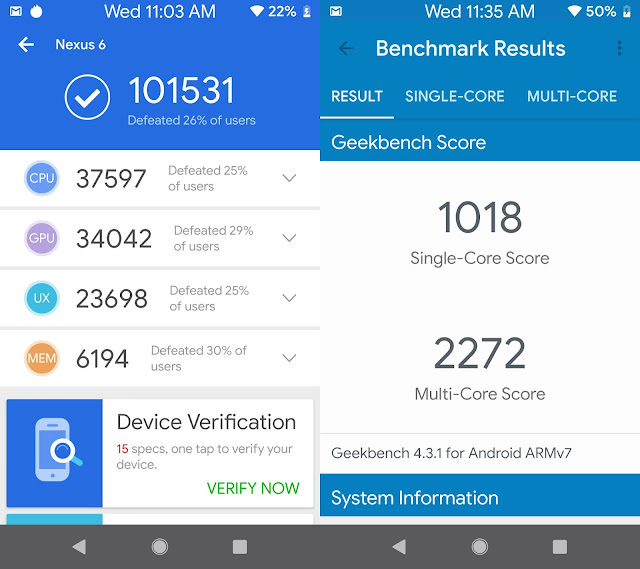 There are customizations for the status bar, hardware keys, quick settings, navigation bar, lock screen, recents, notifications, and even the animations. Most of the features offered by the ROM are present under Pixel Dust Settings, which you can access from the Settings menu. There are settings for gestures too. 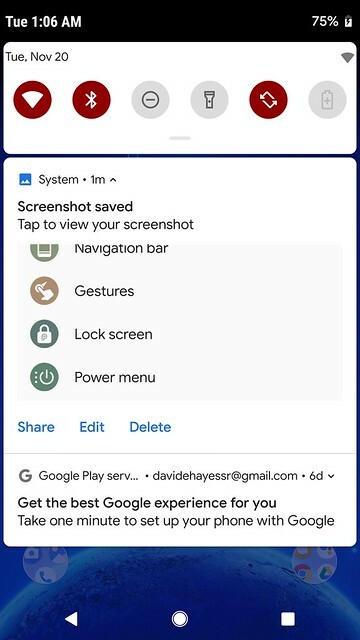 There's the three finger swipe down to take a screenshot, swipe fingerprint for notifications (will vary from device to device), double press the power button to jump to camera, swipe up on Home button (default navigation on the Pixel 3), double tap to wake device (again, varies from device to device), lift to check phone and prevent ringing. If you are looking for the "Pie Gestures" you need to go to Settings > System > Gestures and you will be able to add in that famous "Pie" double swipe up gesture for recents and the app drawer, which I frankly don't care for that much. With that said, this ROM also allows for you to use Oreo style resents instead, if you are a fan of the Rolodex style recents like me. There are notification and battery LED options along with the Pixel Dust wallpapers, which in my humble opinion, is a custom touch that is left out of too many custom ROMs these days. Pixel Dust has some built-in theming options. You can choose the background colour from Light, Dark, Black, Shishu Nights, Chocolate, and there are also a number of accent colours available. The ROM also supports Substratum themes. You can view the complete list of features in Pixel Dust by clicking on the button below. I have also included the screenshots of the customizations. 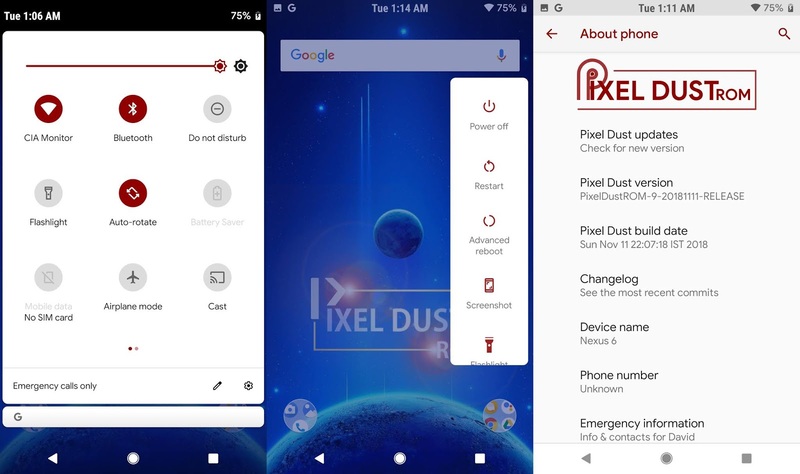 Pixel Dust is one of the feature rich Pie ROMs available right now. You might think that more number of features may compromise the stability, but nope, that isn't the case. As I mentioned at the beginning, this ROM is one of the smoothest I have tested so far. It's stable for daily use and receives monthly security updates with bug fixes and new features (if any are included). I don't believe in synthetic benchmarks and go more by real-life usage. 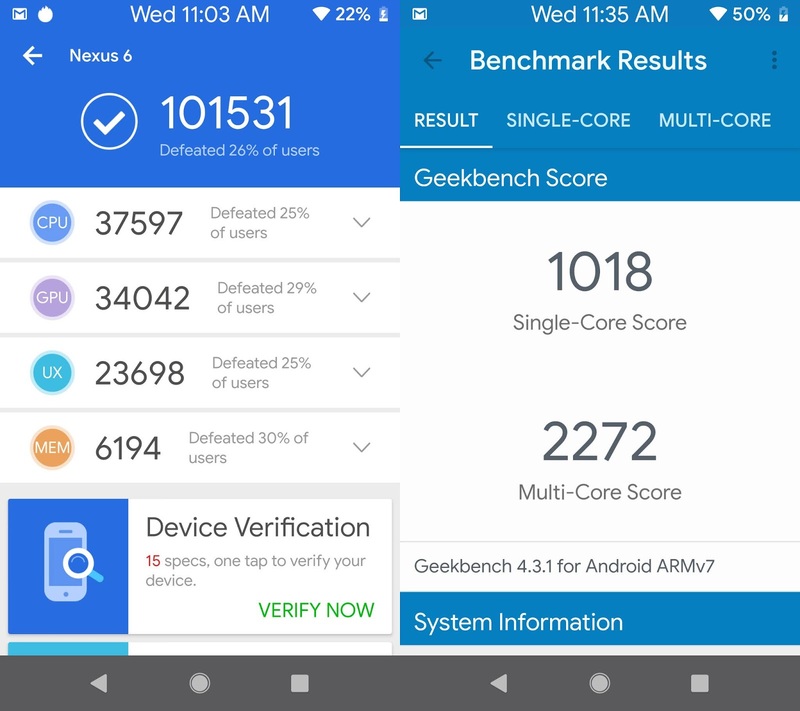 But, Krittin, if I can say, forced me to put the Pixel Dust through AnTuTu and Geekbench 4. I have just included the screenshots for Krittin's sake. I will say it again, Pixel Dust was very smooth on my nearly 4-year old Nexus 6. As stated earlier, my device is over 4 tears old now and I am running on my original battery so my results may not be actual results for a newer battery or one in a better condition. I also need to say that I do not believe in "SOT'S" (Screen On Time). This differs greatly from device to device as does the performance of the CPU and other hardware related items. With that said, here are my results. I get about 4 to 6 hours SOT, which I believe is the numbers most of you want. As for standby time, I plug my device into charge as soon as it hits about 15% to 20% and never charge over 90%, so my battery will last me a full day unless I go on a YouTube watching binge or decide to use the onboard camera for making a video. I did not notice any difference in the battery use times coming from both Nougat and Oreo to Pie and this custom ROM. But I will add that the kernel is based on Elemental X by "flar2" and compiled with Google Android clang toolchain. I think that this kernel is the reason for its awesome stability and battery life. This ROM comes with very few apps pre-installed and the developer lets you decide what apps you want on your phone, so this ROM is very light. The XDA thread OP suggests using "stock" Open Gapps 9.0. I used the "nano" package but you can follow the developer's printed instructions if you are new to custom ROMs. The default apps in the ROM are Browser, Camera, Clock, Email, Gallery, Music, Phone, Play Store and Settings. The ROM is not rooted out of the box. I am not going to ramble on, to try to keep this as short as I can. I did want to mention that there was an issue with the settings force closing for some when switching between Oreo and Pie style recents, but the developer assured me that this will be fixed on the next update and maybe as soon as I am done with this and get it posted. I didn't notice it as I switched to the Oreo style and kept it there. The ROM is updated by the developers whenever they get the time and feel like updating it. The latest security patches from Google are merged soon after they are released on AOSP. You can expect the ROM to be up-to-date in terms of security. The kernel version of the ROM on my Nexus 6 was 3.10.108. It may vary for you. The ROM also has an OTA updater so you will get a notification when a new build is released. We are still at least eight months away from the release of Android Q, so the development of Pixel Dust should continue till then, and the ROM will get more features (hopefully!) and become more stable with further updates. As for the lock screen security, you can setup pin, password, fingerprint, and pattern lock. Smart Lock also worked fine for me. Face Unlock, which is an option under Smart Lock, is present. It works great and is one Pie feature that doesn't always work that well in other custom ROMs. I almost forgot this one but was reminded by my friend Krittin Kalra, one of the other awesome writers in here, that I needed to include this since it works so well. I would like to mention that you have to choose at least the nano Open Gapps package to get Face Unlock. Lockscreen PIN quick unlock, directly show pattern/pin on the keyguard lock screen and automatic face unlocking preference are just a few of the security mods. One of the most important things I have to bring up is that no Pie-based custom ROM out for the Nexus 6 that can be flashed onto a phone that is encrypted. So, you have to decrypt your phone or it will not boot up. It will throw you back to TWRP recovery, asking for a password that you will not be able to come up with. This, according to the developer Nitin Chobhe who made the ROM for the Nexus 6, is a Google issue and may take some time to overcome. It all has to with the Nexus 6's hardware and Pie's support (or lack of) for the Nexus 6. All in all, this is one of the best Pie ROMs that I have tried to date. I highly recommend it (if you want the latest and greatest on your device). You do need to be wary of the whole "encryption issue" (if you have a Nexus 6), but other than that this ROM is easy to flash and runs great. It has just the right amount of custom features with an awesome team of developers to support it. I recommend you to install it. Happy flashing!